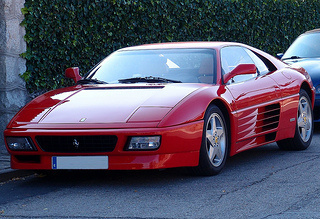 The Ferrari 348 TB and TS sports cars underwent some styling and output changes in the latter part of 1993 to produce a new 348 GT Series, and were designated the 348 GTB and 348 GTS, together with the 348 Spyder. The colour of the bonnet and lower skirts were changed from black to the same colour as the rest of the body. Since the rear tyres now incorporated wider rims, the rear track was increased by one inch. The setup of the suspension was modified to improve both handling and ride characteristics. A smaller fuel tank was added which helped to reduce weight, provide additional space, and add extra support to increase the rigidity of the chassis. Compared with the previous sports car, the engine and gearbox were positioned four inches lower, which would improve handling as a result of the associated lowering of the cars' centre of gravity. 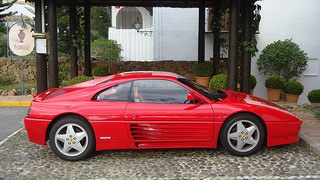 By the time production of the two seater 348 GTB Berlinetta ended in 1994, a total of 252 units had been built, when it was succeeded by the Ferrari 355. 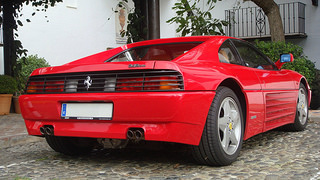 The Ferrari 348 GTB sports car was, once again, powered by the same 3.4 litre, double overhead cam, V8 engine, with four valves per cylinder, as used in the 348 TB. However, it now developed 320 bhp at 7200 rpm (312 bhp in the US export model), and 238 ft/lbs of torque at 5000 rpm. Fitted with a five speed manual gearbox, it produced a top speed of 175 mph, and a 0-62 mph time of 5.4 secs. It now had two of the improved Bosch Motronic 2.7 engine control units to monitor both the fuel injection and electronic ignition systems. The compression ratio was increased from 10.4 to 10.8:1, there was an increase in fuel pressure, the camshaft timing was revised, and a new exhaust system was added. Like the TS, the two seater GTS variant was fitted with a detachable Targa-style roof panel that could be housed behind the seats when not in use. In this way, it benefited from either fully enclosed or a partially open style of driving. The sills were now in the same colour as the rest of the car, having previously been finished in black. Since it had the same engine as the GTB, there was no change in performance. When production ended in 1994, a total of 137 units of the 348 GTS had been built. 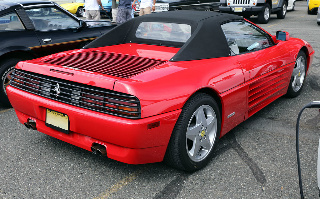 Introduced along with the 348 GTB and 348 GTS in 1993, Ferrari presented the 348 Spyder, a completely open convertible, and the first such model for many years. LIke the GTS and GTB, it was powered by the same 3.4 litre, V8 engine, and therefore produced the same performance. It weighed 1370 kg, and by the time production ended in 1995, a total of 1,090 units were built.